Los Angeles Free Press underground newspaper. January 1969. Vol 6, Issue #234. 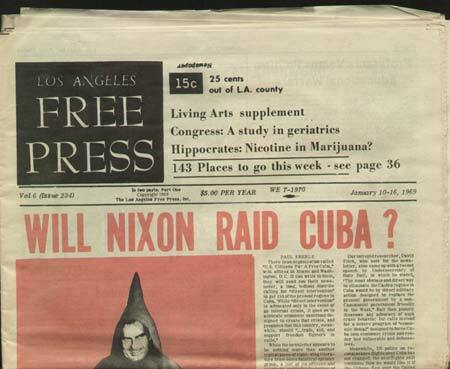 The Los Angeles Free Press was edited and published weekly by Art Kunkin, and is one of the country's most notable underground newspapers. Contains politics, art, music, hippie culture, concert ads, classifieds, and more. Early issues such as this one are becoming harder to come by. Issue is complete - no missing pages or ads.